ATHM50x headphone is the best sounding headphone with great performance. Audio Technica offers the pure base with professional features and exceptional quality. It’s actually safe to say that it’s the best performing headphone available and quite popular too. From great sound to its unique quality, these headphones make a mark. Overall, it’s an awesome budget package with great features. ATH M50x headphone is a professional studio monitor headphone so it is great for mixing music. The performance of the headphone is sonic and it is actually top rated. 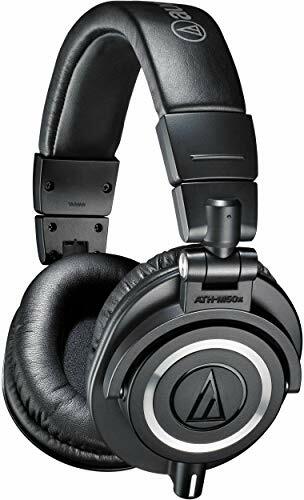 ATH M50x headphone has a deep extended bass base and that is the highlight of this good sounding piece. Each sound that you hear is clear and crisp. The design of the headphone is in trend and the fit is flexible. The best part about the headphone is that it is compatible with almost all the devices. You don’t have to buy a separate headphone for your individual needs. ATH-M50x professional monitor headphone features sonic signature, with the additional feature of detachable cables. If you compare it with the M series, then this headphone gives you complete value for money. It’s better than its last variant M40x. It’s a great pick if you are searching for a budget headphone that has some amazing features. Is it perfect for your gaming needs? Well, yes it is perfect for your gaming because it features deep bass base and that makes the sound clear. The best part of this headphone is that it is not too heavy on the bass and not too focused on the highs. You can hear the mid-range sounds clear and that makes all the difference. For video editing needs, this headphone is just perfect for you. Even if you are a music editor, this should work well for you. A studio headphone always suits music needs and is comfortable in fit as well. Long working hours will not really bother you now. The vocals are clear and the frequency base is good. You can buy this headphone for your professional needs and you would surely not regret the decision. At a mid-range price, this is the best headphone available. From a visual point of view, the ATH M50x headphone looks quite mind-blowing. If style also matters to you, then you can go ahead and pick this one for a good price. The headphone can also be used as your regular music companion. You can hear your favorite tracks on the loop, as the voice clarity of this headphone is mind-blowing. There are many great features of ATH M50x headphone; let us look at some of the key features. The headphone provides an outstanding clarity all through an extensive frequency range that too with deep, perfect bass response. ATH M50x headphone gives a great sonic performance and it is recommended by top audio engineers. The headphone has 45 mm large-aperture separate drivers with exceptional earth magnets and is covered with copper-clad aluminum wire voice coils. It features a 90° swiveling ear cups and that makes it different from other headphones. In fact, this feature is actually good for professional needs, studio music mixing, and tracking. Even professional DJs can use this headphone. The headphone has a great design contour around the ears for outstanding sound isolation in loud environments. Though it does not offer complete isolation still it helps to block the noise depending on the environment. The ear cups and headbands are not only durable but also comfortable. Even if you wear the headphone for hours at a stretch, you won’t feel any kind of discomfort. This feature again sets it apart from other headphones that are available in this range. The headphone is truly portable and space saving. You can fold it and carry it in any case or special case that is available. So, it’s also handy while traveling. The headphone is available in removable cables (includes 1.2 m – 3.0 m coiled cable, 3.0 m straight cable and 1.2 m straight cable). ATH M50x headphone is a great choice for studio mixing and tracking. It can also be used for DJ monitoring. It also serves the purpose of personal listening as the sound is awesome. Its available with different sets of cables. 1.2 to 3m coiled cable is suitable for DJs, a 3m cable for monitoring use in the studio and 1.2 m cable for daily use. The headphone is available in white and black color, however black remains the most favorite and popular. ATH M50x headphone is compatible with almost all the devices. You can use the headphone with your tablet, laptop, iPad, and phone. The connectivity and features of the headphone are great and you won’t face any issue on that front. Being style driven also, the headphone is quite comfortable. You can wear the headphone for hours at a stretch and still feel great. There is no such pressure on your ears because the ear cups give a great fit. The audio roots of the headphone are clear and that makes all the difference. Fit wise also the headphone is good. It fits well even if you have a bigger head size. The headband though made from steel gives a good grip. So, the comfort is actually good if you need the ATH M50x headphone for studio and mixing purpose as well. The wide-reaching grip is better as compared to other headphones. ATH M50x headphone has passive noise cancellation feature. So, there is no complete isolation of the sound or noise from the surroundings. It does not completely cancel the noise. The passive noise cancellation feature of the headphone is good to block the external noise if you want to hear your music loud and clear. You will be able to hear the moderate noise because of this feature. Unlike active noise cancellation that gives complete cancellation, it’s not the case with this headphone. Even the low-frequency noises are not completely low, so this actually depends. Still, for this price, it is worth the buy. The build of the headphone is pretty smooth and sturdy. At first instance, the headphone will not look petite to you. The headphone certainly looks like professional headphone and fits quite well. The cups swivel around 90 degrees and that sets it apart. It is ideal for your professional needs because it’s truly flexible. Though the headphone is made from plastic, it also features a metal headband. This gives it a solid grip. ATH M50x headphone has shallow cups so it can cause a problem if you work in a warm environment. It can cause sweating in a hot climate as well. ATH M50x headphone offers the bass power and the low-end corpulence. The sound is pretty clear and smooth. The bass base is accurate and that makes all the difference. You will also experience a low range resonance but again this depends on the frequency of the sound. For listening needs, the sound is not only clear but also well defined. This feature also makes this headphone most popular as compared to the headphones that are available for a similar price. You will get the same kind of sound clarity for gaming and for professional purpose. It’s a clear winner in the sound department. ATH M50x headphone is available with different cables and wire connection. The compatibility is also good as it’s compatible with various devices you use. There is no battery required. You can hear your music or do things you love with different types of cable options that are available. The functioning is smooth and there are no connectivity issues with the headphone. Three different cables are available for your different needs. For professional needs, you can choose a long wire. For casual listening, you can choose the shorter length. The sound is crisp and engaging. Detachable cables are available as per your need. The audio is fairly balanced. Very few colors are available. It can be tight to fit at times. No neutral sound in the headphone. There is no wireless option available. If you are looking for a great headphone with awesome performance, then ATH M50x headphone should be your ideal pick. The headphone is not only great in comfort but performance wise it has so many features. The sound quality of the headphone is probably the best and that makes it quite popular in its league. The best part is, you can use this headphone for your multipurpose needs. So, whether you want to watch a movie or simply track some music, its an ideal choice in the budget and it does the work well. Though there are many options in headphone available, nothing can beat ATH M50x headphone in performance. It’s highly recommended for its durability and overall features. You will not regret buying this one for sure!